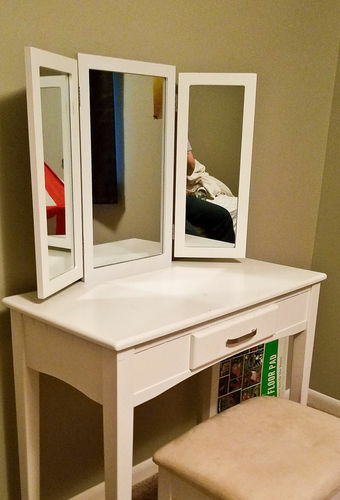 Our grand daughter’s vanity needed some repair. Her little brother broke it. Dang cheap mdf or something similar. After a lot of careful measuring, I designed a replacement in VarcarePro. Sine the thickness needed to be .604 inches, I used some 3/4 inch Baltic Birch and planed it to the desired thickness. Lucky me, the CNC cut it out without any problems. A dry fit of the mirror and back showed my measurements were right on the money. Two coats of Shellac (sanded in between) and two coats of Rustoleum rattle can paint and it turned out to be a smooth and a very close match. And, we have a happy camper. Well done. Now tell her little brother to stay out of her room and leave her things alone!!!! !